Think outside the box, or inside the Silo? I recently read some very interesting discussion points answering “How to get employees to be more innovative and creative?” in the Operational Excellence Group on LinkedIn. One of the points that was brought up, and that I’ve witnessed myself, is that in organizations that do not subscribe to lean philosophies, management in these organizations tend to build their organizations with silo structures. There seems to be a utopian view of silos by some managers where assigning resources to a specific function and ensuring they only focus on that function brings a certain level of control. In fact, it can be said that the silo structure is a very good way of controlling and knowing what everyone in an organization is doing. In general, managing silos is easier because functions are dedicated and thus knowing where an additional resource is needed or not needed is relatively easy to identify. This makes for ease at work-load balancing. We’ve all heard the terms: “you have a job to do”, or “don’t color outside the box”. The big problem I have seen with Silos, and I’ve experienced this first hand, is that the spirit of cooperation between groups is limited to working and improving deliverables from one silo to another. Because the nature of silos is to ensure resources are used to the max, individuals have little lee-way in experimenting with extracurricular tasks. The goal is to do the job that’s been assigned. Even the attempt to assist or make an unsolicited suggestion to improve another silo is viewed as interference. Lean organizations, by nature, break with the silo mentality and thus require a different kind of management team. They require one that is engaged with and spends time at Gemba. Because resource allocation is not black and white, they need to coach and foster a cross-functional culture. They understand that 80% of an individual’s work load is to complete a specific job, but the other 20% is to engage in extracurricular functions. These functions, in general come down to cross-departmental training or participating in kaizen activities. These managers understand the value of giving individuals flexibility to learn and observe. They provide the tools and time to allow them to engage functions outside the box. The benefit of lean is that individuals are encouraged to work outside the box, and think outside the box. The very nature of lean requires everyone to continually improve. It’s not about delivering the task you’ve been assigned, but going one step further and improving it. Teamwork and idea sharing (yokoten) is a key component here, and thus individuals are welcome to participate and collaborate in problem solving cross-functional teams. This type of functional cross pollination results in what is termed a ‘learning organization’. The ultimate benefit is that teams and individuals are not only trained on their tasks, but also have good knowledge of other functions of the organization. This allows them to improve and innovate more effectively because they have an understanding of upstream and downstream processes. They no longer innovate to improve their work areas, as they would in silos, but rather innovate to improve not only their area, but other’s areas. Often, workers in lean organizations are referred to as "engineers" because they are in a position to not only identify problems but solve them too. Ultimately, for managers, this gives them a different kind of control. Even though they must spend more hands-on time at gemba, they are given the benefit of the agile organization. One that is more adaptable to rapidly changing situations. So what how does this translate to that original discussion on LinkedIn? In silo based organizations it is hard for individuals to be innovative because the encouragement is not there. They are constantly being reminded to “do their jobs”, and that usually does not mean to engage in improvement activities. In a lean organization individuals are encouraged to improve. In fact “do your job” has a different meaning in lean… it includes not only performing you main functions but also working to improve the organization as a whole. At the center of “the house of lean” is people, teamwork and Kaizen… and Kaizen is innovation (albeit, incremental innovation). 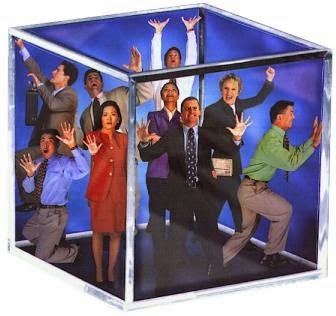 Thinking outside the box is a byproduct of lean. Posted on Friday, April 19, 2013 by George R.
Very nice sharing dear George R According to me kaizen event, sometimes called a kaizen workshop or kaizen blitz, you are very true in making a scatch in our mind about kaizen event, well you can make your blog more interesting with more research, if I say... thanks for sharing dear..